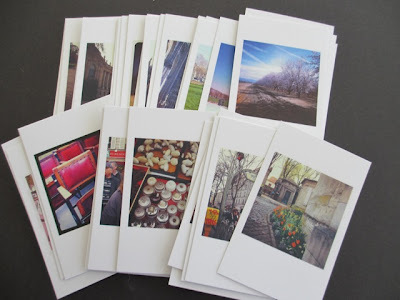 A few months ago I ordered Instagram prints from Printstagram (say that 3 times, fast). This was my first time sending away for Instagram prints, so really it was more of a test to see how they would turn out and if I liked the quality. I found the service easy to understand and really easy to upload. Printsagram takes you to your Instagram account where all your photos are. Then you just click on the picture you want (not gonna get easier than that!). And yes, you can order more than one of a picture, which I love. You get 48 prints for $12 (I chose matte finish) which I thought was a great price for cool, tiny, little photos. I decided to make something using one of the photos of the Eiffel Tower I took when I was in Paris in May. After a long day visiting cathedrals in the countryside, Sande and I walked to the park to wait for the tower to light up. All I can say is...magical. Anyway, I chose this image, cut it out, then adhered it to a piece of book board. The picture cut out is only 1.75 x 1.75", really darling when it is that small. Next I tried it on several of the ATC size papers inside Paper Stash - Lost and Found. Should I use the daily note paper? or maybe the tiny text? Well, I didn't end up using any of them but picked another from the same paper stash...but you will have to wait and see which one. I decided to make a box or frame for my little picture to elevate it since it's so tiny. I went to the garage but this time I could only find this skinny wood that my husband usually uses to back things. Whatever, I'll make it work. I also had some pieces of broken yardsticks I got for free at an estate sale. Good enough. The board was 4" wide so I cut it 5.5" long. Okay, my husband was at work so I used my Olfa roller cutter to cut the wood. It worked, but I might need to change the blade soon. After it was cut and sanded, I covered the wood with Sticky Back Canvas. To give the Sticky Back Canvas a bit more texture I use Archival Ink - coffee to stamp random lines using a stamp from the SA Mixed Media set. I did not use an acrylic block so the stamp would look more random as if the texture had worn away. I also blotted off some of the coffee ink onto a paper towel before stamping on the Sticky Back Canvas. I cut another piece of book board (2.5 x 3.5")for the ATC size paper from the Paper Stash. Which one did I choose? The subway sign. I inked the paper with Broken China Distress Ink to give it a subtle blue color then adhered the paper to a bookboard piece. I sanded the edges to take away some of the text, then inked with Frayed Burlap. Cover with Snow Cap Paint Dabber. Then wipe away the paint with your finger tip or a baby wipe leaving the white paint in the text. I used the new Paper String to secure the Word Band to the bookboard as shown below. A little Wonder Tape on the back of the picture to add it to the center. I used foam tape to secure the bookboard piece to the Sticky Back Canvas. Then sanded and inked two Vial Labels, cut them in half and slipped each under the bookboard (I did stamp the date before I added it to the piece). So here is where the yardsticks come in. I cut the yardsticks (again, with my roller cutter) so they fit the initial book board piece then glued them together with wood glue and taped the edges together with blue painters tape until dry. I added the Clock Key to the top of the box with one of the new long screws. The word, "see" is from the Chitchat sticker book. I used a eye screw to hang a Type Charm from a piece of Lace Chain (the light bulb icon came from the File Tabs pack) . I did secure the type charm with a piece of foam tape. The finished box is only 4 1/4 x 5 3/4" but it looks much larger in the previous pictures. I think one of the reasons I like this project so much is that it is little... and the picture so tiny. The structure is all about highlighting the photo. Well, that's it for today...now it's back to work. Oh, but one last shout out to Olfa for making a blade sharp enough to cut through wood! Every girl's dream! *Ranger Inkssentials WONDER TAPE 1/2"" Double Sided 15 ft. I LOVE this! What a great idea. Thanks so much for sharing! WOW! that's totally Awesome! 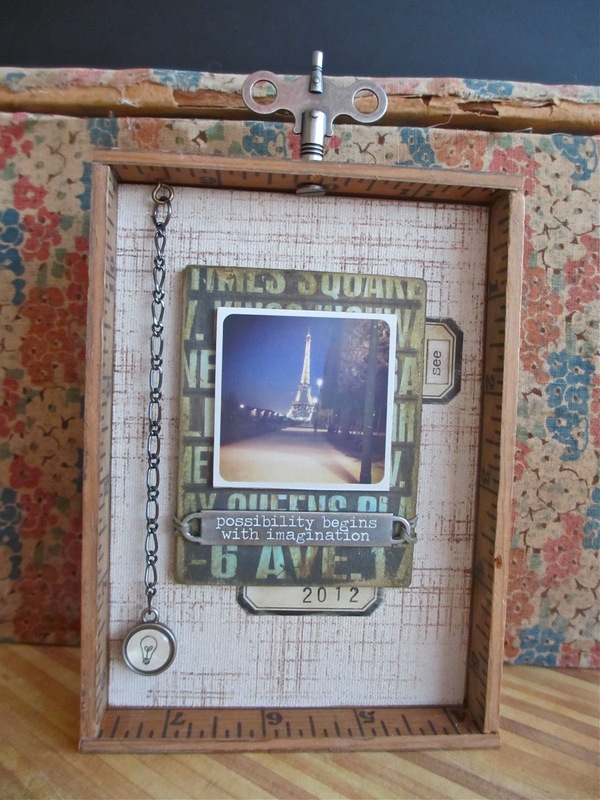 Love how you made the little shadow box to house to house it! it's all so cute! TFS! so this is the project you "whipped" up in your free time? I was expecting a tag or a card.. Maybe you need to set you sites lower….a tag takes a lot less time than making a frame. Of course this looks freakin' amazing. 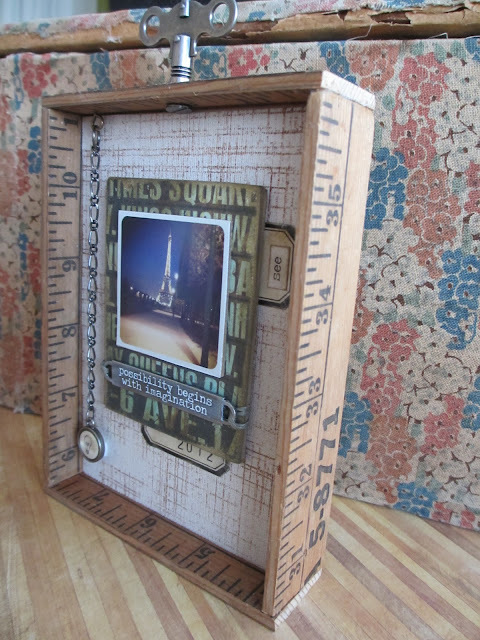 Honestly you make me feel like such light weight- I wouldn't even think of making this amazing frame and I have an unhealthy addiction to vintage yard sticks. don't we all have an unhealthy addition to vintage yardsticks? I thought it was a given..just saying. I'm totally doing this! Thanks for sharing your "Imagination". You are too clever!! Thanks for sharing. I must be living under a rock - love those little photos! That box with the ruler is awesome and love the added little details with the stickers! So tell me - what is the longer screw? Is that something new of Tim's? Okay - you can ignore my question - I see the longer screws now - that is awesome - I had some issues with the pulley wheels because the screws were too short - this is awesome!!! What an AWESOME project! Thanks for sharing and thank you for the Printstagram advice. Ive been trying to figure out the best way to order prints. What a fabulous way to show off a great pic! 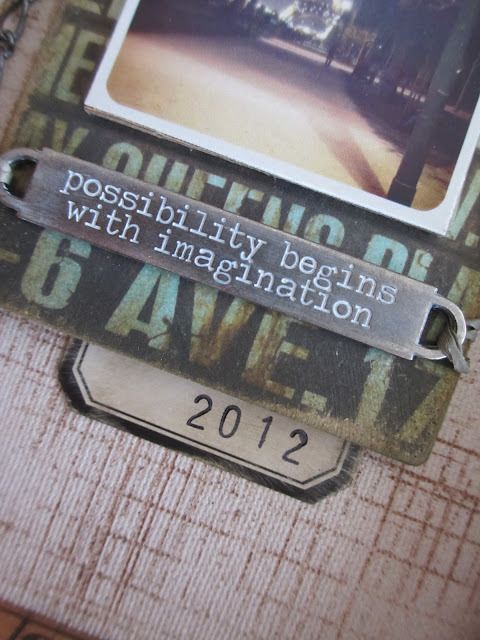 I was looking new fresh ideas to use a couple of old ruler I have at home, this is great!! Very cool, Paula. Love the small size. 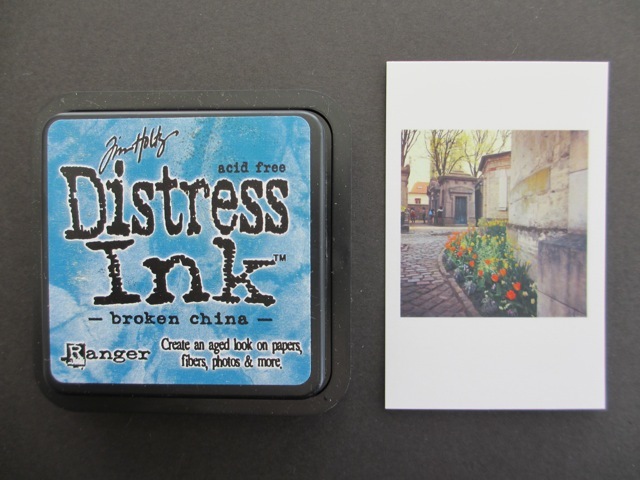 Now you can display it anywhere and move it around as the mood strikes. Amazing project, thanks for sharing. I always love your projects, and your clear instructions! This one is inspiring and I might have to go on a search for those old yarsticks! What an adorable project! I love that it's small. It can be displayed just about anywhere. Great project Paula - as always! Your imagination never rests.....thank goodness for us! Beautiful project. Photo just pops out from that gorgeous box. I love your little project, it is just great. What a wonderful project - I love it. I have made tiny little pictures and framed them - uses the imagination and they are fun!! Thank you for sharing this! This is adorable and I must try it as I have several yardsticks hanging around my sewing room. Thanks for sharing, it looks fantastic. This project is another favorite for me! I love the size, love the instagram (I am going to have to learn more about those now, too), and, I especially love the clock key on the top. Thanks for the how to/thought process and all the pictures. OMG this project is amazing. Thanks for all the detail photos and documenting your process. I so want to try to go recreate, this is amazing! You are a wizard! I love this project and can't wait for some of these new products to be available. Not having used much of Tim's stuff before, I have a lot to learn (and buy!). Thank you for all your teaching and inspiration. Also, love that background...wallpaper? Judy, that background is a old wood box covered in fabric. Picked it up in Boise Idaho a couple years back. Paula, as always such a fabulous little creation. So inspiring! Bravo! Awesome! I love the tiny picture's, definitely going to check out if we have some kind of service like that. Thanks for sharing!